Newly engaged couple Prince Harry and Meghan Markle revealed new details on their relationship in an interview with the BBC from Kensington Palace. 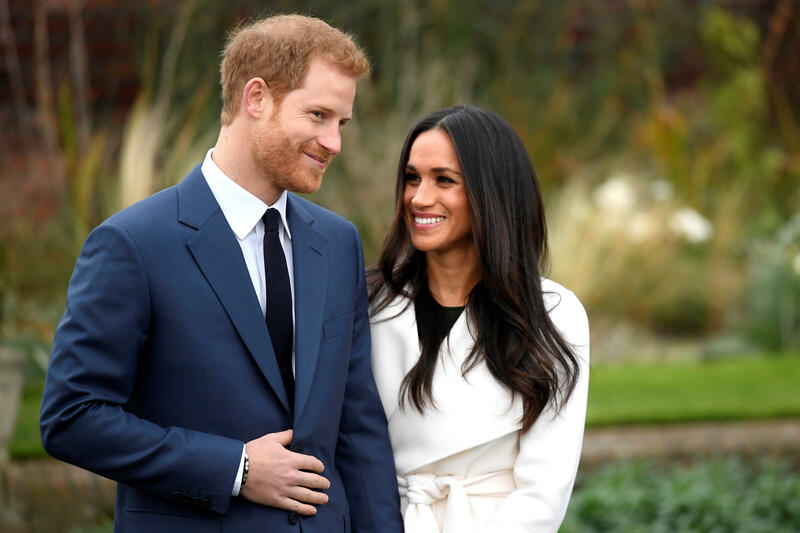 Harry, fifth in line for the British throne, will marry American actress Meghan Markle in the spring, palace officials announced Monday, confirming months of rumors. The couple revealed that they actually got engaged earlier in November. Markle said, "It was an amazing surprise. It was so sweet and natural and very romantic." She added that she said "yes" so quickly that Harry "barely" got to finish proposing and had to ask, "Can I give you the ring?" They said the two of them were alone for the special moment at Nottingham Cottage on the grounds of Kensington Palace. Harry and Markle said that despite the media portrayals of the relationship, it was never a whirlwind. The two were set up by a mutual friend, whom they declined to name, on a blind date in July 2016. "It was through her and then we met once, then twice, back-to-back -- two dates in London last July," explained Harry. "Then it was I think three, maybe four weeks later that I managed to persuade her to come join me in Botswana and we camped out together under the stars for five days. ... Then we were really by ourselves, which was crucial for me, to get the chance to know each other." Markle said when their friend offered to set them up, she knew very little about Harry. "The only thing I asked was, 'Is he nice?' Because if he wasn't kind, it didn't make sense," said Markle. Harry said he had never seen Markle's TV show, "Suits," before. "I never heard of Meghan before and I was beautifully surprised when I walked into that room and saw her," he said. Markle and Harry said it was important to keep their relationship out of the public eye so they could get to know each other without tabloid scrutiny. "It's hugely refreshing to get to know someone who's not necessarily in your circle and get to know each other step by step," said Harry. He added that it was a "huge leap" from two dates to going "on holiday together in the middle of nowhere. It was fantastic, absolutely amazing to get to know her as quickly as I did." The couple said they bonded over their desire to make a positive difference in the world. "It was one of the first things we started talking about when we met, the different things we wanted to do in the world and how passionate we were about seeing change," explained Markle. "I think that's what got date two in the books." They said they were able to get to know each other while they kept their relationship private for five or six months, but keeping it under wraps meant their dates often involved staying in and cooking together. Harry joked that it might be good dating advice: "Maybe spend more time at home! It was an opportunity to get to know each other without other people looking, trying to take photos on their phone." Harry also said that amid the happy news of the engagement, he was missing his mother. "Days like these are when I really wish [I had] her around," he said. For Markle's engagement ring, Harry used diamonds from his mother's personal collection as the side stones; they flank a large center diamond sourced from Botswana, where they took their first trip. Markle said, "Obviously, not being able to meet his mom, it's so important to know that she's a part of this with us." She said that she feels she has gotten to know a part of Diana through meeting Harry's aunts and other loved ones of the late princess. The two said they have met each other's families several times over the course of their relationship.